Now, going fast is always going to be the best part about being a car enthusiast, but you should give the things that will slow you down a little thought - D2 certainly have had a little think about them. Big brakes are their speciality and they’re the people to go to if you want to slow down hard, and fast. Normal cars will come with brakes that are designed to work effectively with the speeds and style of driving that are expected of an ordinary driver, but here at Tarmac Sportz, we don’t know any ordinary drivers, just you lot. You want a lot more from your braking system and D2 are more than able to deliver that with their range of big brakes. With these you can stop living in fear of wearing out your brakes and you’re free to really go to town on driving. Unlike the brakes in ordinary production cars, D2 brakes will work even if you’re driving at high speeds and pressing your brakes over and over again. Ordinary brakes, if subjected to repeated hard stops, will quickly wear down and become entirely unsuitable for their intended use. This is called brake fade, but you might as well forget that term right now, because that’s not something you’re going to encounter with D2’s big brakes. D2’s range of excellent brakes are designed to dissipate heat - this results in brakes that can stand up to whatever you throw at them, whether you’re screaming round a track or just zipping about some country roads. Your brakes will stay effective and safe for far longer. The brake pads included with the D2 Racing brake kits are made specifically for the UK D2 Racing brake kit distributor by a large performance brake manufacturer. The pads are designed to be excellent on the road and on the track. They work great from cold and are more than capable of holding their own on the track, be it Donnington or the Nurburgring. They’re the versatile, do-it-all brake pads that your car needs. 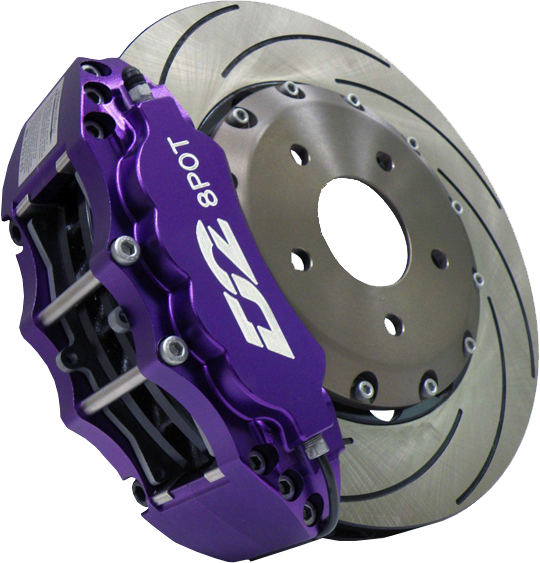 Here at Tarmac Sportz, we’re very pleased to be able to sell you D2’s fantastic braking kits. They come pre-assembled and ready to fit (and it comes with a guide if you need a little help). All of the parts are built to the highest standards. The bell is manufactured from lightweight aluminium, which keeps unsprung weight to a minimum and reduces servicing costs. The most important bit of your brakes, the calipers, are also made from aluminium with steel mounting brackets for strength. External Dust Seals prevents sticking or dragging brake issues and ensures you’ll get the best in performance when you need it most. Now, in terms of options, you get a choice between Drilled or Grooved discs and plenty of colours. The default colour for the D2 Racing calipers is a deep crimson, but if you fancy something else, then there’s also black, purple, and yellow for no added cost.